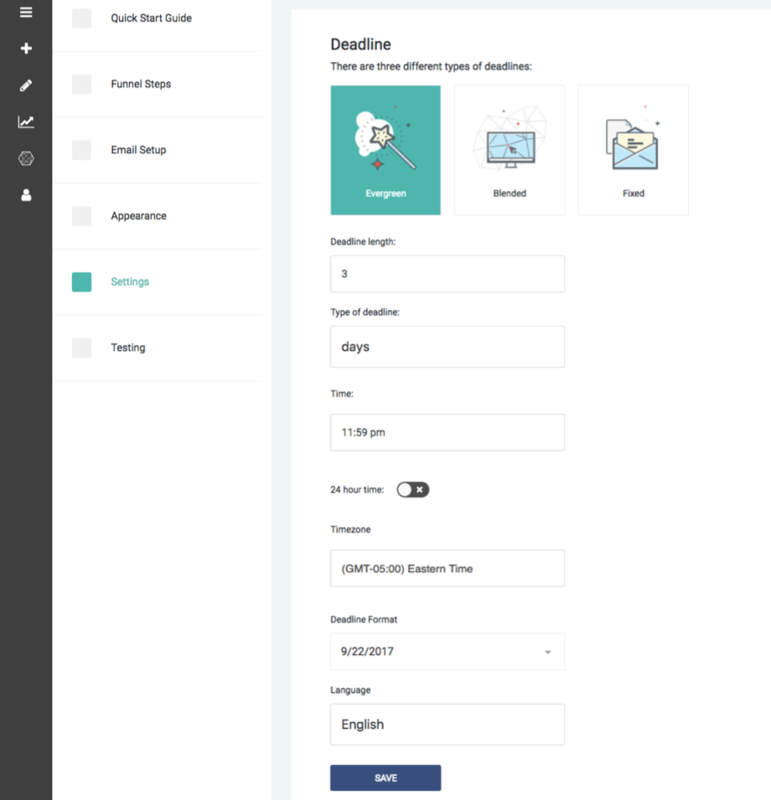 If you are creating your new campaign from scratch and not using one of the blueprints, there are four different types of campaigns you can use with Deadline Funnel: Fixed, Evergreen, Hybrid, or Quantity. This option is appropriate for any marketing funnel where each lead shares the same fixed deadline. Examples include: Product launches, one-time promotions, flash sales, or any other kind of promotion where everyone has the same deadline. The Fixed deadline is the same for everyone in your funnel, so there's no tracking involved. You select the date and time that you would like the deadline to expire and once that time passes, we'll redirect everyone away from your special offer page. This option is for any marketing funnel where each lead's deadline is determined by when they enter the funnel. Examples for this type of campaign include: Lead generation funnels, email follow-up sequences, upsell pages, automated webinars, or any kind of marketing where leads are entering your funnel on an ongoing, daily basis. Evergreen differs from a Fixed deadline because it tracks each individual via IP Address, Cookies, and Email Address, and requires a point of entry, or what we refer to as a Trigger. You can find more information about the different Triggers and select which one you would like to use in the Quick Start Guide. For this kind of campaign you can select how many days, hours, or minutes you would like the countdown to last. If you select days, then you can specify what time of day you would like the deadline to expire (we recommend using 11:59pm). Click here for more information on how to calculate out the length of your Evergreen deadline with the length of your email sequence. 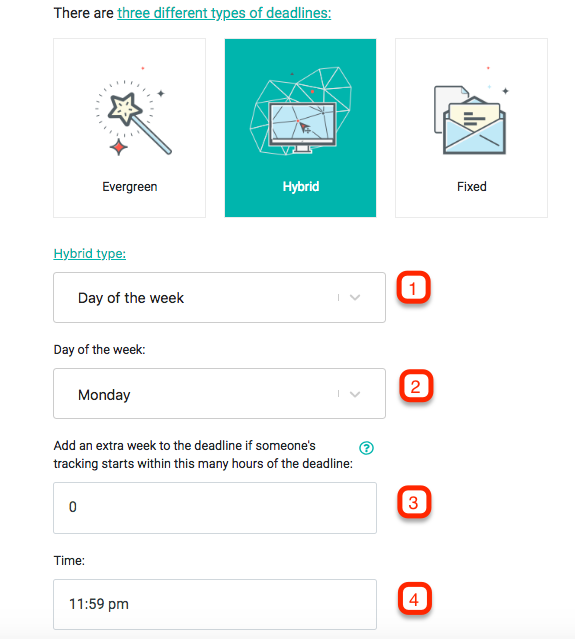 This option is great for any funnel where you want the deadline to expire on a set day of each week regardless of when people enter the funnel. 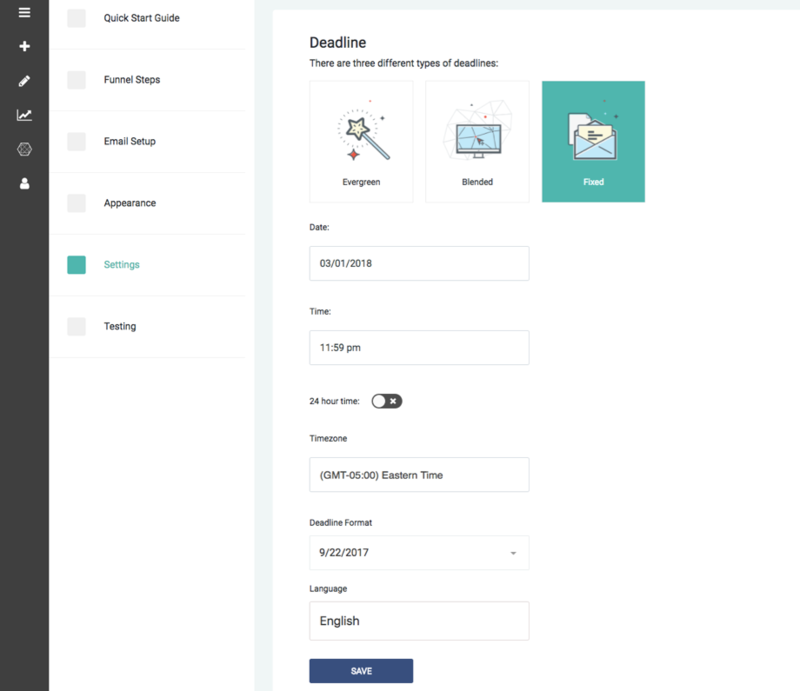 This option is great for any funnel where you want the deadline to expire on a set day of each week, month or quarter regardless of when people first enter the funnel. For example: You want each person to get their own unique deadline, but your special offer page needs to close on Thursday at Midnight each week, regardless of if someone enters the funnel on Monday, Tuesday, or Wednesday. To use this hybrid funnel type you will 1) select 'day of the week', 2) select the day of the week that you want your deadline to expire, and 4) select the time the deadline expires. Item #3 in the image above is for another option with the Hybrid deadline type, to "Add an extra week to the deadline if someone's tracking starts within this many hours of the deadline." Example: Deadline is Wednesday at 11:59pm EST. But you want anyone who starts their tracking between Tuesday at 9am and Wednesday at 11:59pm to actually have a deadline of the following Wednesday (7 days later), instead of the Wednesday during that same week. So you set the "Add an extra week..." option to 39, so that anyone who is tracked within 39 hours of the deadline (between Tuesday 9am and Wednesday 11:59pm) gets an extra week added to their deadline. This option is great for any funnel where you want the deadline to expire on a set day of the month regardless of when people first enter the funnel. For example: You want each person to get their own unique deadline, but your special offer page needs to close on the 15th of the month. 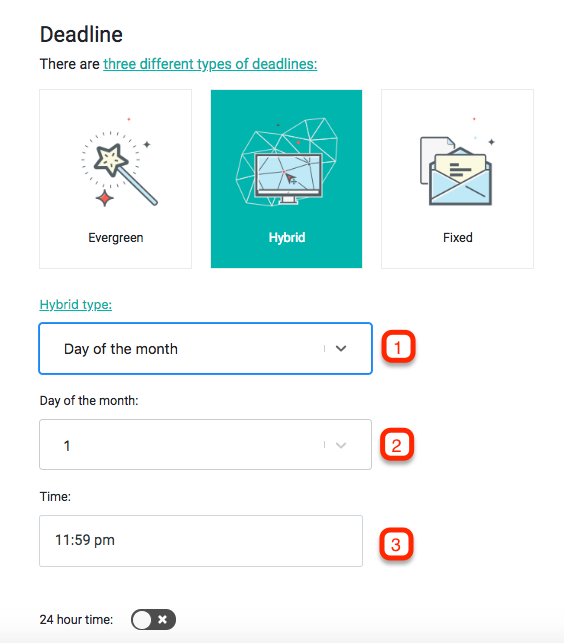 To use this hybrid funnel type you will 1) select 'day of the month' as the hybrid type, 2) select the day of the month that you want your deadline to expire, and 3) select the time the deadline expires. This option is great for any funnel where you want the deadline to expire on a set day of the quarter regardless of when people enter the funnel. For example: You want each person to get their own unique deadline, and you want your special offer to close on the 5th day of the 2nd month of the quarter, regardless of when the lead enters the funnel. Then the deadline will expire in the 2nd month of the next quarter, on the 5th day of that month. 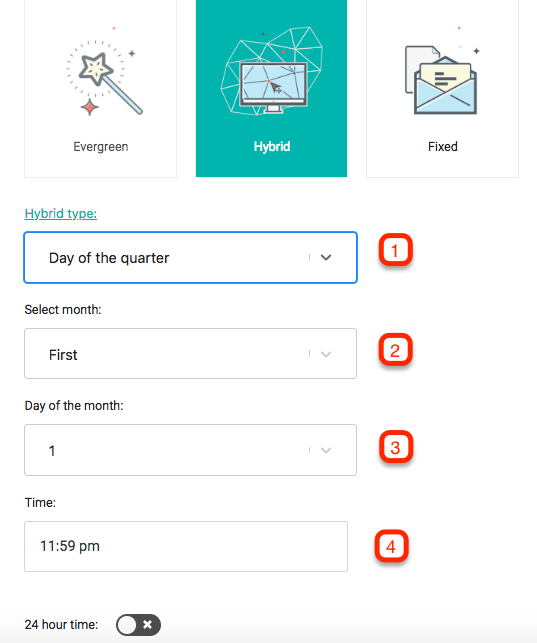 To use this hybrid funnel type you will 1) select 'day of the quarter' as the hybrid type, 2) select the month of the quarter, First, Second or Third, 3) select the day of the month, and 4) the time that the deadline expires. This option is for any marketing funnel in which you want to offer a limited number of items and have Deadline Funnel close the deadline when that numbers reaches zero. You make this special offer available to a specific number of buyers. Examples for this type of campaign include: Fast-action bonuses, upsell pages, or any kind of marketing where only the first ___ number of buyers can purchase your offer. For this kind of campaign you can select the opening quantity available and the period of time during which you will offer the promotion.